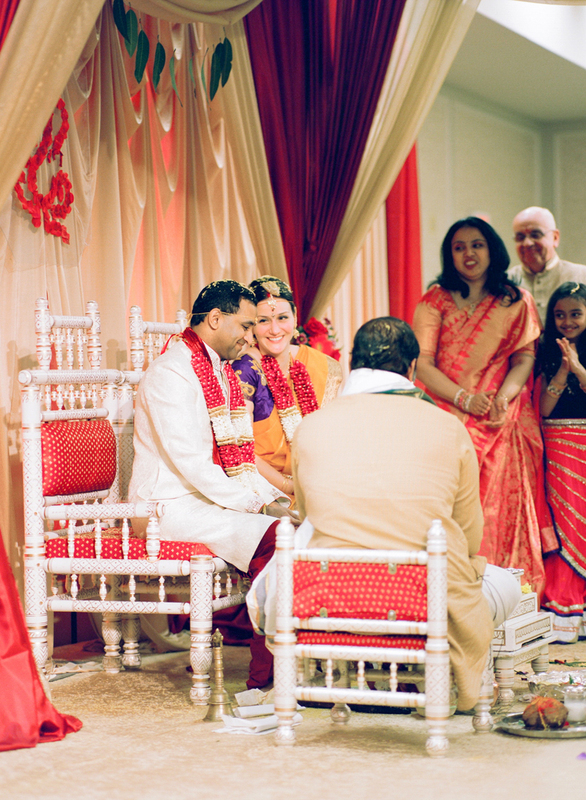 After Day 1 of Jen & Raj’s wedding celebration in Madison came Day 2. 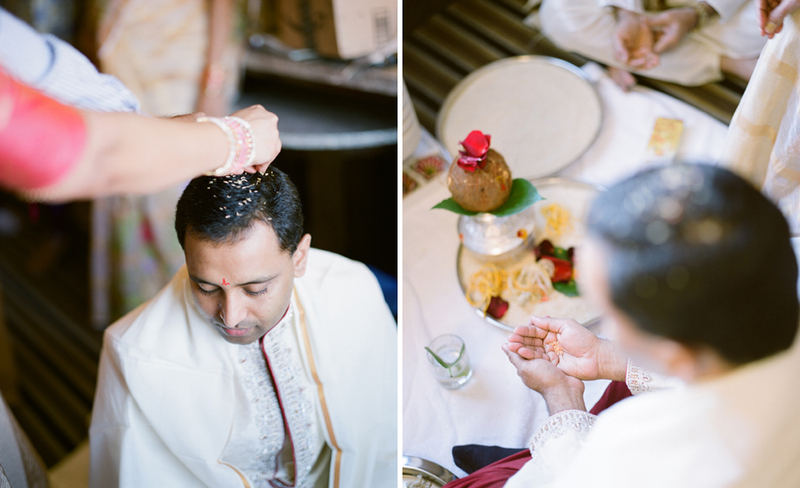 The resounding agreement among many of their guests who hadn’t seen a Hindu wedding ceremony before was the feeling of being truly honored to witness and be a part of such incredible cultural traditions. And, we couldn’t possibly agree with them more!! 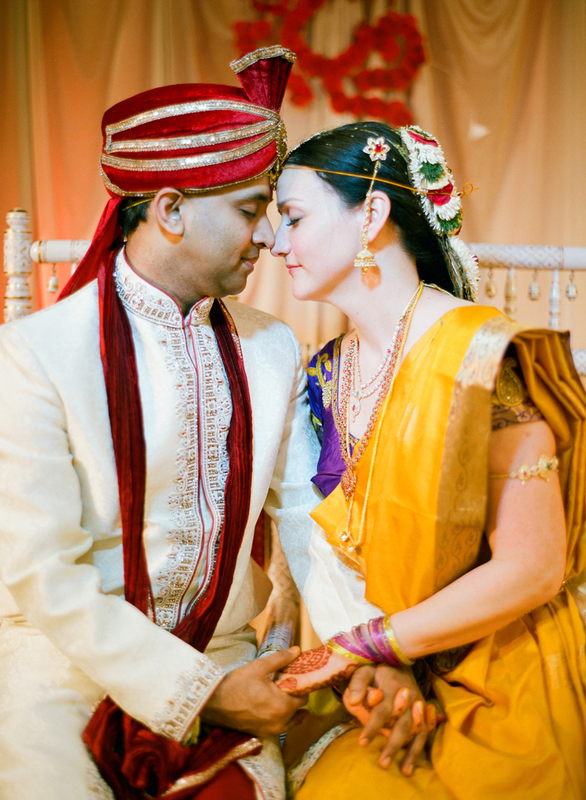 Raj’s family brought countless vibrant silk Sari’s and beautiful jewels with them from Hyderabad, India – all of which were custom-made for Jen & Raj’s loved ones to wear. A Henna artist from Chicago spent hours upon hours sharing her art on the ladies’ hands as the morning excitement swirled around their room at the Concourse Hotel. While Raj attended the Ganesha and Gowri pooja, a blessing that took place in his room, Raj’s sisters began dressing Jen. Each of them wore their own stunning color, and Jen was being draped in a rich yellow Sari. Photographing these moments where Jen’s parents and close friends were in awe of the transformation happening before their eyes was something we will never forget! After her Sari was styled just so, it was time for Jen to be dolled up in symbolic jewels Raj’s family had selected for her. With her dark hair and sparkly eyes, Jen looked like a queen! Meanwhile, Raj looked like a king in his traditional attire. Jen attended her blessing, the Gowri Puja, then it was time to make her way to the beautiful Mandapam in a grand room where all of her & Raj’s guests were seated. During the ceremony, Narasimha Chari Samudrala, a Hindu vedic priest from Chicago, made sure to tell everyone that none of the rituals happening were lost on Jen. He went on to say, she made sure leading up to the ceremony that she understood the reasons & history behind every ceremony ritual she would be a pet of with Raj. The two of them even created a detailed ceremony program so all of their guests would have a sense of the significance and meaning as well. 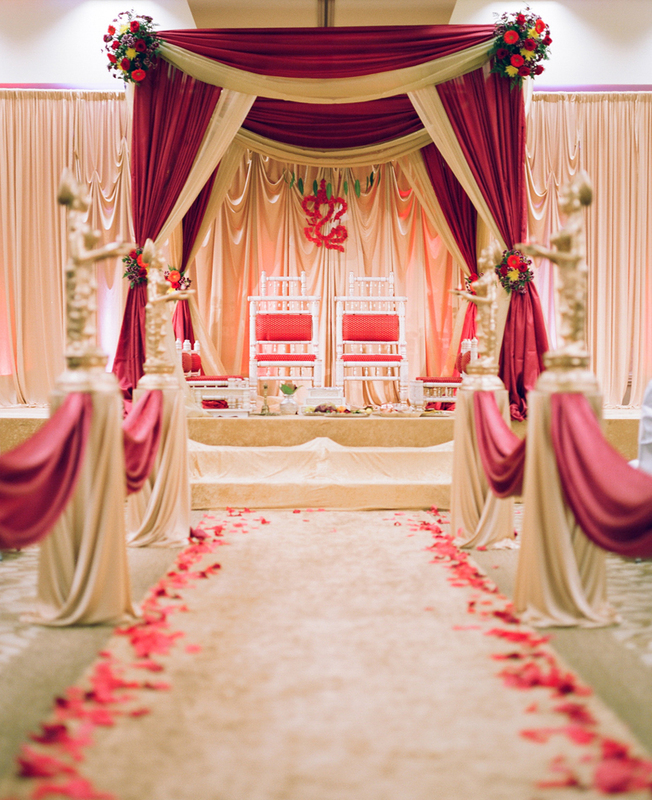 Jen & Raj's wedding truly was a whirlwind two-day celebration! The corners of our smiles hit our ears, and our eyes have never been wider. Much of that was due to the beautiful wedding Jen & Raj planned for their guests, but most of it was due to their kind hearts and wonderful family. We felt like special guests while photographing, and we are so thankful we were the ones capturing so many moments for Jen & Raj. Thank you from top to bottom and side to side of our full hearts!! Wisconsin Indian Wedding Photos captured with Contax 645, Pentax 67, Hasselblad 500cm and Nikon F100 on Fuji Pro 400H, Portra 800, and Ilford XP2 film. Processed by Fast Foto. Posted in Weddings Tags: "madison wi wedding photographer", "hindu weddings in wisconsin", "indian weddings in wisconsin", "Wisconsin indian wedding photographers", "indian wedding photographers in wi", "wisconsin indian wedding", "indian wedding in madison wisconsin"